Martin Truex Jr. captured the pole Friday for Sunday’s Pennsylvania 400 Sprint Cup Series race at Pocono Raceway. Truex’s No. 78 Furniture Row/Denver Mattress Toyota Camry covered the 2.5-mile triangular track in 50.211 seconds at 179.244 miles per hour. Coming in second was Toyota teammate Carl Edwards, who ran a 50.315 at 178.873. Truex advanced to the Pocono pole shootout round by posting the second fastest speed in the first session and the fastest in the second. It was the third pole of the season for Truex, 10th of his career and his first at Pocono. The three poles in one season equals a career best for Truex, which he set in 2009. Truex’s other poles this season were at Kansas and Charlotte. 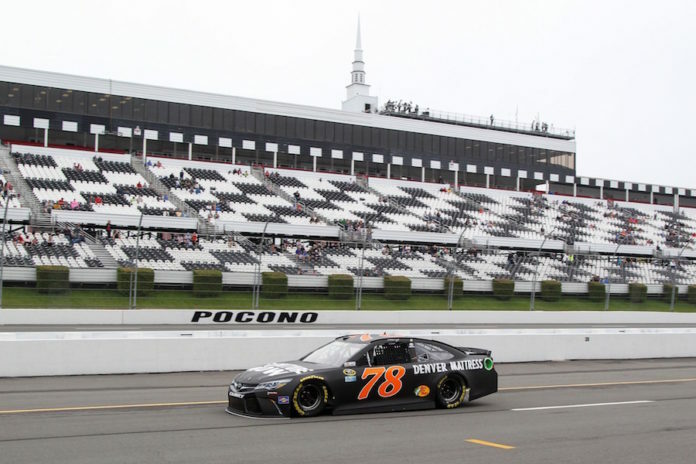 The car that Furniture Row Racing brought to Pocono was the same Toyota in which Truex scored a dominating win in May at Charlotte Motor Speedway. The top-12 qualifying positions in order were: Truex, Edwards, Paul Menard, Denny Hamlin, Ryan Newman, Tony Stewart, Brad Keselowski, Chase Elliott, Matt Kenseth, Joey Logano, Kyle Larson and Austin Dillon.